A pioneer in stroboscopic photography, Harold E. Edgerton was born in Fremont, Nebraska on April 6, 1903. Milk Drop Coronet. © 2010 MIT. Courtesy of MIT Museum. Edgerton bought his first camera at the age of fifteen and set up a dark room in his parent’s house. While interested in photography, he chose to study electricity and worked at the Nebraska Power and Light Company. He received his bachelor’s in Electrical Engineering from the University of Nebraska in 1925, and his Master’s from MIT in 1927. Edgerton received his doctorate in 1931 and began teaching at the school, where he remained for 40 years. His experiments with flash tubes as a graduate student led to the invention of the stroboscope—a device that fired a repeatable electronic flash—in 1931. Edgerton used the stroboscope to capture images that eluded traditional photography, with the help of Kenneth Germeshausen, a former student. In 1932 he began photographing activities that occurred beyond the perceptive abilities of the human eye: a hummingbird in flight, the corona of a drop of milk. Sports photography embraced this technique, and the public appreciated the mix of science and art apparent in Edgerton’s images. Edgerton’s high-speed photography was used in collaboration with MGM Studios in 1940 to create the Academy Award-winning short film Quicker than a Wink. His photographs were exhibited at the Royal Photographic Society of London and the Museum of Modern Art in New York. Edgerton did not see his photography as art, however, and chose to focus instead on its practical applications. He assisted the US Army Air Force in 1944, directing strobes to enhance nighttime aerial reconnaissance photography. Edgerton received the Medal of Freedom in 1946 for his contribution to the success of the invasion at Normandy. In 1947 he collaborated with Germehausen on a system to time and fire US nuclear bomb tests. Self-portrait with Balloon and Bullet-1959. © 2010 MIT. Courtesy of MIT Museum. In 1953 Edgerton began focusing on ocean research and invented sonar and underwater photography devices, working closely with Jacques Cousteau. His sonar “thumper” was able to penetrate the sub-bottom of the sea floor, and was used (along with his “pinger” device) for research aboard the Woods Hole Oceanographic Institute’s Chain. He joined Greek archaeologists to search for Helice, an ancient city submerged by earthquakes and volcanic eruptions, in 1966. He was inducted into the National Inventors Hall of Fame by the US Patent and Trademark Office in 1986, and that same year one of his underwater cameras captured images of the sunken RMS Titanic. In 1988 he received the National Geographic Society Centennial Award and the National Medal of Technology. 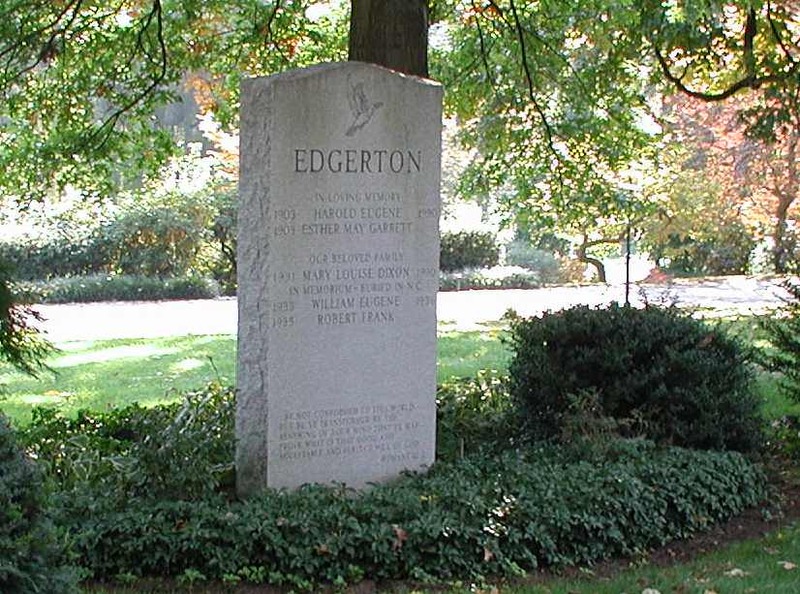 Edgerton died of a heart attack on January 4, 1990 at the MIT Faculty Club. He was survived by his wife, Esther May Garrett, daughter, Mary L. Dixon, and son, Robert. The Harold E. Edgerton Educational Center in Aurora, Nebraska was founded in 1995, with the mission of celebrating Edgerton’s legacy and expanding on his work. 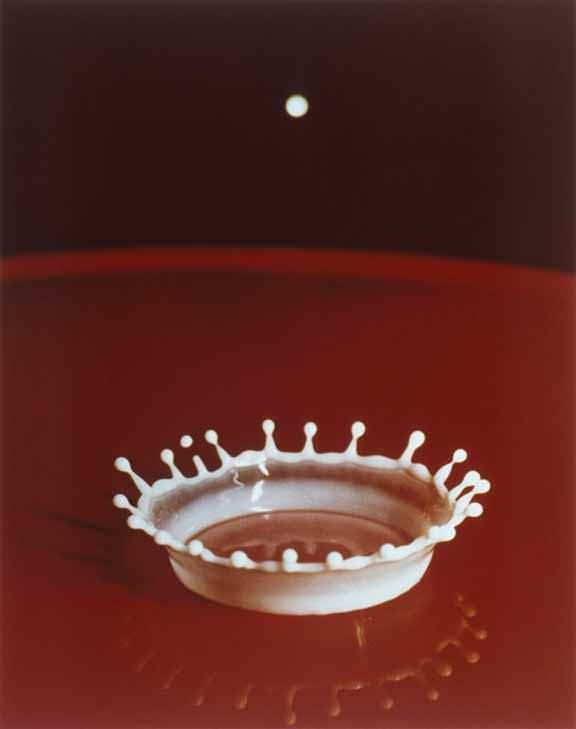 For more information about the life and work of Harold E. Edgerton, including galleries of his photographs, please visit the Edgerton Digital Collections Project. 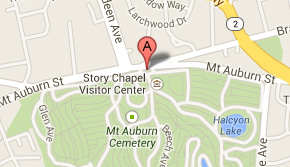 Harold E. Edgerton is buried at Mount Auburn in Lot 7990 on Begonia Path. Top image of Harold Egerton © 2010 MIT. Courtesy of MIT Museum. Adapted from the research of Judy Jackson and Laura M. Gosman, as published in Mount Auburn’s Person of the Week: Harold E. Edgerton, 2001.